Crichton, now aboard a dying leviathan named Elac, encounters an alien named Sikozu who aids him in stopping the Grudeks who are intent on obtaining toubray (Leviathan neural cluster tissue). Elac arrives at the planet where D'Argo, Jool and Old Woman are investigating the ruins of an ancient civilization. Crichton must find the third probe to end the magnetic summer, while avoiding Grayza and Oo-Nii. When stopped off on a planet, Rygel leaves the rest of the group and is caught in an unbreakable orange substance while stealing treasures he discovers in a cave. When D'Argo, Crichton and Noranti go looking for him, the cave seals them in. Two huge grunts appear who have protective armor which protects them from weapons fires. D'Argo, Rygel, Crichton, Chiana and Sikozu get back to Moya only to find that Scorpius is there waiting for them along with Aeryn, now suffering from heat delirium. 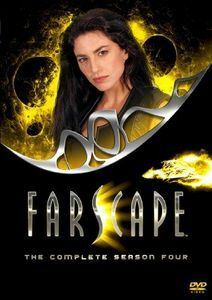 Aeryn has granted Scorpius asylum and claims that Scorpius saved her life. While in close proximity to a wormhole, Moya is preoccupied and doesn't notice a slowly moving object heading towards her. Moya collides with the object which then covers her entire hull, causing great discomfort to her as well as the crew. While on a transport pod, Chiana nags Crichton to try out a virtual reality game. A transmission comes through from D'Argo concerning a problem with Scorpius. Despite this, Chiana pulls Crichton into one of the games, where they become trapped., and the only way out is to complete the game. A group of bounty hunters come aboard Moya and take everyone hostage. When Crichton arrives back with the Old Woman he destroys the bounty hunter's ship and goes aboard Moya to rescue everyone while the Old Woman puts herself into a coma where she can survive outside the ship. Moya arrives at a planet where Aeryn gets accused of murder. The crew consume food, sharing amongst themselves. Although if not ingested by the same person, it becomes toxic. They must quickly find a cure or they'll die. 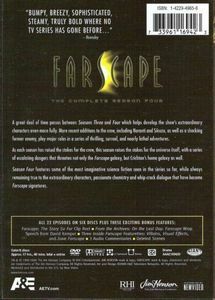 Crichton falls into a wormhole and meets up with a strange man who shows Crichton the consequences of wormhole travel. After accidentally returning to Earth, Crichton discovers it he is in 1985 and he has altered the time line, causing his father to be scheduled to fly on the doomed shuttle 'Challenger'. Moya arrives at Earth in present day, Christmas. The crew show their ships and technology to Earth's scientists. Crichton starts writing a journal. The creature left on board Moya by Grayza manages to get to Earth where it starts killing and hunting down Crichton. Moya takes on a new passenger, Talikaa, when Chiana insists upon it. However Talikaa turns out to be an alien creature in disguise and is intent on harvesting the crew's neural energy. Scorpius signs D'Argo, Crichton and Rygel up for a training camp where the students learn mental discipline by battling in an artificial environment. The women of Moya travel to a dead Leviathan to buy a sensor beacon for Moya which will allow her to appear to be a different ship. While there Aeryn and Sikozu spy on a secret meeting between the Peacekeepers and the Scarrans. Crichton watches a documentary that Moya receives from Earth about their recent visit showing interviews with Crichton's relatives and other people who interacted with the crew. Crichton and Scorpius travel to one of the 'unrealized realities' where Crichton believes he heard Stark say "Katratzi." Meanwhile on a Scarran ship, Aeryn resists torture. Moya arrives at a station where the Scarran vessel transporting Aeryn is docked. Moya arrives at Katratzi. Crichton attends the peace talks between the Scarrans and the Peacekeepers ...with a nuclear bomb. With the option to leave on the Peacekeeper Command Carrier no longer available and his nuclear bomb disarmed, Crichton must follow Scorpius' plan and destroy the Crystherium Utilia. With their Crystherium stores low, the Scarrans must travel to Earth through a wormhole as those flowers grow there. With Pilots help, Crichton tries to collapse the wormhole leading back to Earth.